Haven't completed this project yet. I will update this page when I have done so. I wouldn't advise using this information until it is completed,as it may not be correct. The only thing here is pin 4 which is the external antenna. Just connect a piece of wire to it. This deals with having two buttons, On and Off, to determine what the transmitter sends. 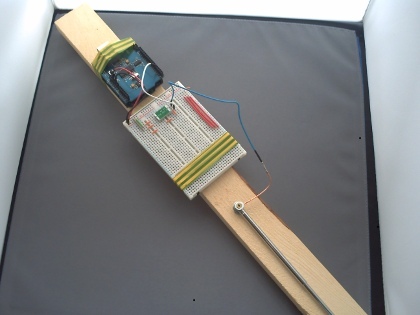 As, this was one of my first arduino projects, I had a few problems getting the wiring correct. 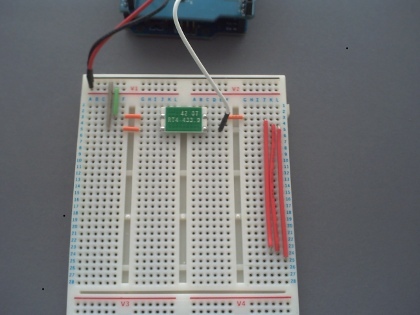 A quick look @ Arduino Button in the Tutorial, resolved the issue. I had forgotten that it is not like wiring up a front door bell and required an Electronic approach rather then an Electrical one. Tut Tut! I will post the circuit here real soon. I completed this section without many problems on the hardware front. The transmitter only has 4 pins. I was able to get one button working to switch on a device. Cool. I couldn't get the second button to work. I decided to abandon it as it wasn't really important to the goal of the project. I chose data pin ?? 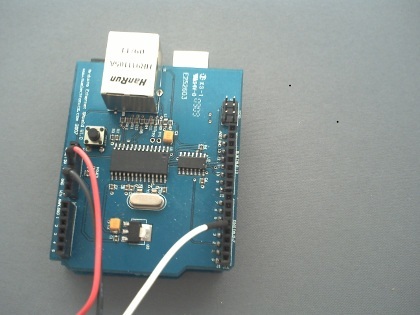 on the arduino as it was not used by the EtherSHield. I could have chosen others but there you are. View of the simple wiring required for the arduino side. The wiring for the transmitter vary simple. There are only 4 connections on the transmitter and one is for the arial. I had a few problems initially identifying the correct pins. With the information shown here, you should not have a problem. Here is the first configuration for the UAT phase. Rather then spend time fitting it into a box, I decided to tape it all to a plank. It makes it easy to change, while maintaining a rigid structure. Then came the software part. Being fairly new to the Processing language, I decided to copy from the work of others. What I wanted was a small web server that I could pass the commands using the URL. The Arduino then takes the data from the URL and parses it. The results are transmitted to the relevent Homeeasy device. So, two functions = two scripts to be merged. For the Ethernet part, I used the example of the Web Switch from the nuelectronics.com web site. As I was using the Arduino and Ethernet Shield from them, it was the obvious choice. The Homeeasy transmitter script from the Transmitter Manual Protocol example from the Arduino Playground provided by Barnaby Gray and James Taylor. So, I played around with these scripts, modifying and tweaking it until it was working as I required it. What I ended up with works very well and is reliable. 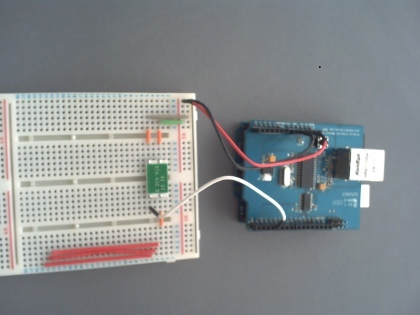 There are two components, the Arduino code and a PHP script to call the web page on the Arduino and pass the commands via the URL. Sweet! Here is the web page produced by the PHP script that I use to control the various devices. I plan to have a more sophisticated page with other devices shown but this is good as the first cut. Note to self: Put example code here.